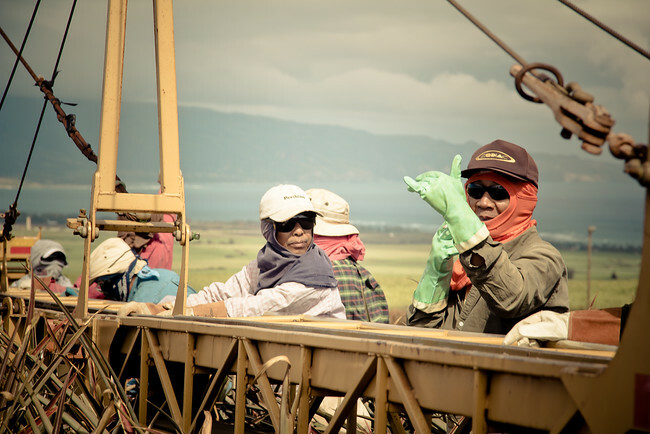 I arrived just in time to judge the Maui Agricultural Festival but before the event I met the other judges and we went to tour the Maui Gold Pineapple Farm. Is there anything more iconically Hawaiian? The first thing that caught my eye was the pineapple express bus, and I was relieved I wasn’t the only one to pass an immature giggle before we started the tour. I learned cute facts like that pineapples are not native but from Brazil, that they were named pineapple because they look like a pine cone and taste like an apple, and that you should never cut the top off but twist it and store it upside down so that the juice from the sweet bottom can resettle throughout the fruit. And I expected this to be a light breezy tour, but that soon ended when I started thinking about how much we pay for food. I won’t buy a pineapple if it costs more than $3.99 but I had no idea what actually goes into growing one. 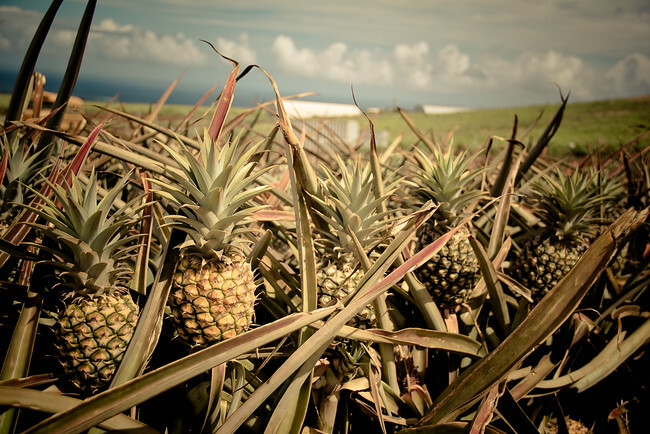 It takes two years to grow the first generation pineapple. It’s only one year for the next but the fruit is much smaller. 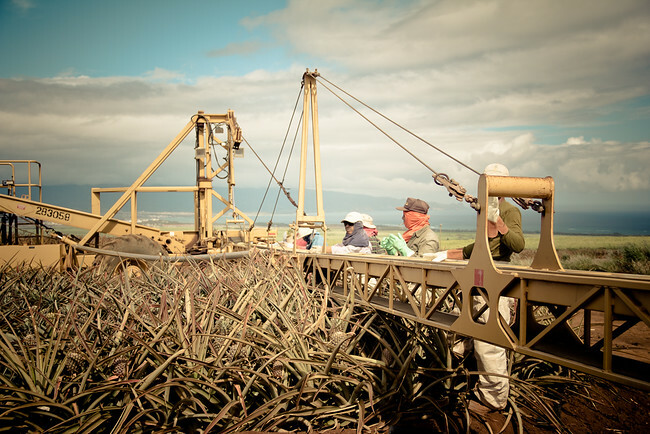 Pineapples are still planted and harvested by hand. Relatively speaking the workers are the mostly highly paid in farming. 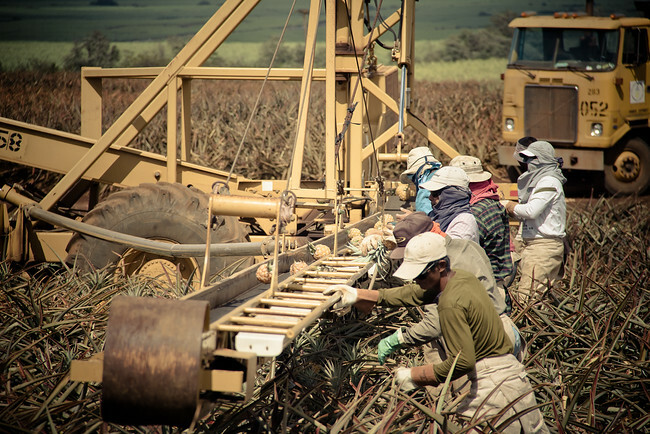 Most plant 7000 pineapples a day and can make $40/hour. But this is a young man’s job as most of the day is spent bent over. They only plant three times a week and I’m guessing on the other days they are at the chiropractor. This is not an easy job and I’m sure they pay for it later in life. We tried different types of pineapple and it was delicious but all I kept thinking about was the manual labour and two years of growth. I will never complain about the price of pineapple again. This is amazing! And you say you’re not a journalist. Crazy good. I’m a huge pineapple fan. I ate a whole one for lunch just the other day 😉 Those pineapples in your photos look delicious! I can’t wait to try home grown pineapple! $3.99?? Wow, I was paying a buck for pineapples in Phuket…. Nice photos! I didn’t realize there even were different types of pineapples. I’m kind of bummed I missed out on this while in Maui. WOW! WOW! WOW! Check out those pineapples! I knew many came from Hawaii but I never thought about touring a farm! SO COOL! Your pictures are so fun! Pineapple is so good….especially pineapple flambee, even better than banana flambee. This makes me feel terrible about the 99 cent pineapples at a store here. Where do they come from?! Looks like intense labor! Great shots!!! I’m working at a smoothie shop in Oahu at the moment — to make some side money during our RTW trip — and we sell Maui Golds fopr $2! So this post is totally fascinating! Wow I learn more from this post about PINEAPPPLES than when I went to the DOLE PINEAPPLE plantation in O’ahu a few years ago. It is interesting though to see the rows & rows of pineapples grow. Oh & when they are babies… they are so cute just hanging on there. Love the photos btw. I used to hate pineapples. Now I love them. However, it’s pretty cool to learn about pineapples. I had no idea they took that long to grow! Interesting stuff! I went to a pineapple plantation on Oahu last year, but we didn’t get to learn very much about what actually goes into growing them. Love the Pineapple Express bus! Love your photos, and also finding out the origin of how the pineapple was named! I love informational tidbits like this! I also really love pineapple. It has to be one of my top favorite fruits. When I was little, I’d eat so much of it that the top of my mouth and my tongue would go raw, and I still wouldn’t stop. Gosh, I haven’t had pineapple now in AGES. You’ve just given me a major craving! Fresh pineapple is so much better than canned too. Wow I had no clue. Makes me appreciate our abundance so much more. Thx for sharing. I never even thought about how pineapples got their name — now I know. I’m actually not a big fan of pineapple, but when I’m in Hawaii I do get the urge to eat them — seems like the right thing to do. Wow, who knew? Same here. I’ll never complain about pineapples again. The same with strawberries after I witnessed what the workers have to go through with those. My first job was picking strawberries for 25 cents a box, it is truly grueling work. Wow, TWO years? I had no idea! I know, it blows my mind that pineapples cost less than $10 now. I know, it now blows my mind that pineapples cost less than $10. It is like a chicken bus in HI! I thought there was this kind of pineapple bus only in Brazil. There are several of this around here where you can buy 3 pineapples for $5. I thought they were expensive but now I know it takes two years to grow and sell. Crazy!